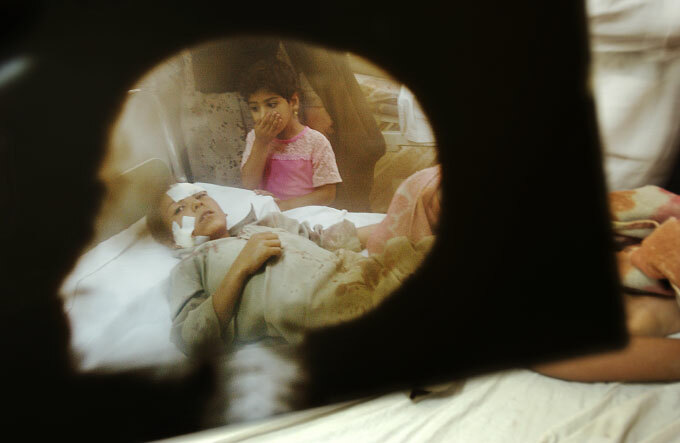 A doctor in the Fallujah Hospital raises an X-ray to point out head injuries to 9-year-old Hussein Ali Al-Jumaili, whose home in the nearby village of Al-Sheker was attacked in American airstrikes. His 12-year-old brother was also seriously injured in the attack and three members of his family, including his father, were killed. The Al-Jumaili family says they were visited the following morning by an American army officer who said the attack was a mistake and offered an apology for the deaths and injuries. An army spokesperson did not aknowledge any mistakes and said that one "enemy fighter" was killed in the airstrike.